Keeping the home-fires burning: Comfort foods. Yours? Truth be told, the chicken dinner you see here is both an easy and ridiculously satisfying meal to put together. One that took very little prep and didn’t cost a lot. I spent seven bucks and change on the chicken. 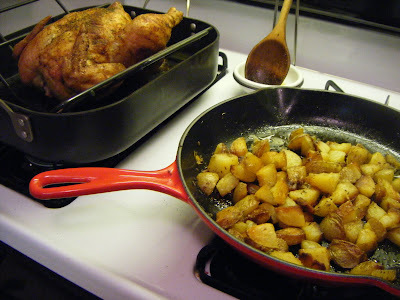 Potatoes are cheap, or in my case “free” — as I’ll explain in my next post. That homemade bread cost bupkes, since we’re talking three cups of flour, a scant amount of yeast, a quarter cup of cheap beer, salt, vinegar and H2O. And the iceberg was $1.49. Comfort food. You’ve gotta love it. So tell me: when hell freezes over (or the Seattle version of it does, anyway), what foods warm your soul?